Most of us were born with an innate desire for other people to like us. Say what you want, but I think it's in you too. You might preach a manifesto of self-assertion and independence from the ideals of others; but deep inside that crusty heart of yours there is a place where you like to be liked. If not, then your soul is dead. I'm joking. Calm down. Take some breaths and let's move on. I've noticed that I can get on people's nerves, and they can get on mine. I suppose it's part of humanity--to bicker and fuss at each other. But the question I am asking myself (and I suggest you ask yourself) is, "How can I make people hate me?" I know it seems backwards, but if you start with this question, you might find out that you're already doing a pretty good job at something that's not even on your to-do list. So let's get the ball rolling. #1 Talk endlessly about yourself and your interests. "But Dan, I don't know what else to talk about when I'm around people." I know. Sometimes we inadvertently do things that make people hate us. Then we feel bad when we find out that people hate us and label ourselves as "misunderstood". No, you're not misunderstood; you're just not doing a very good job perceiving how others perceive you. 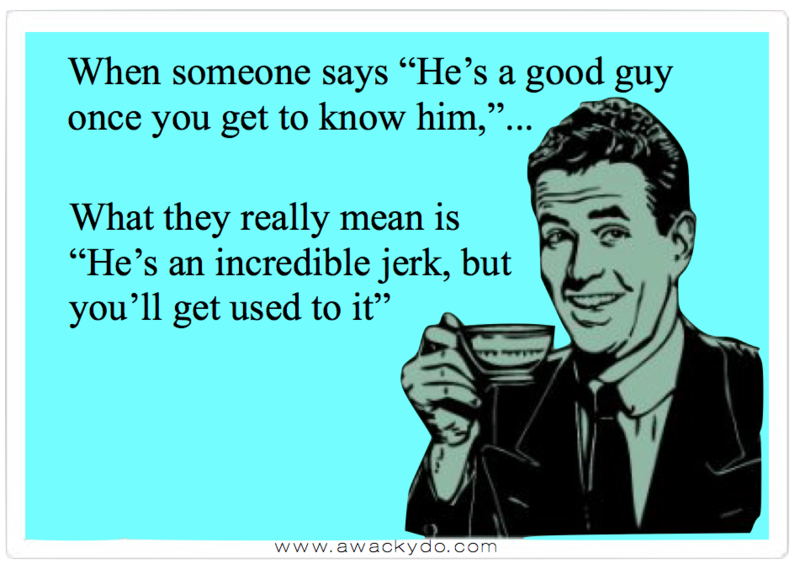 So I'm not calling you a jerk--I'm just calling you ignorant. Ignorant isn't an insult. I am ignorant of many things, but I plan to keep learning. Whether your social encounter is business/professional, community/casual, or something in between, the principles stay the same. Talk about yourself only if it is directly relevant to another existing conversation, or if someone asks you a question about yourself. "So what am I supposed to talk about?" For starters, ask people questions. Questions start conversations. Unbridled verbal escapades about yourself kill conversations. Nobody wants to talk to you after that because they're afraid if they bring up another topic they'll have to listen to another detailed story about you. So they clam up and put you on their list. Complaining is the psychological equivalent of cooking cabbage to me. It smells so bad I want to leave the room. And most other people share this aversion. "But Dan, complaining is how you make things better." There is truth to this, but the issue is semantics. Complaining is the act of whining and fussing about something for the sole enjoyment of whining and fussing without any intention of helping or solving the problem. This is my biggest qualm with people who are always whining about the government. It's not that I think they are wrong--it's that they are (often) not doing anything to fix it. Criticizing or critiquing something means identifying a problem or short-coming in something or someone with the intention of getting the issue fixed. Critiques leads to improvement. If you want to critique, you should also jump in and try to make a positive difference. #3 Make sure everyone is aware of your accomplishments (or lack thereof). This ties to #1--stop talking about yourself all the time. You may be a decorated veteran, a brilliant musician, a Nobel laureate, or a well-trained brain surgeon; but nobody really cares if you are force-feeding that information to them. Even good food tastes bad when it's shoved down your throat. "But Dan, I haven't accomplished that much, so this doesn't apply to me." Oh yes it does. You will waste everyone's time telling them how many things you haven't done or haven't achieved, as if everyone should stand in one accord and proclaim to you that you're still a superstar in spite of your short-comings. This also applies to talking about your children. It's great to be proud of your kids, but you must understand there are people that don't care about your daughter's piano recital or your son's ping pong skills. Please do not go to work and make people watch videos of your child playing Beethoven's 5th by memory. #4 Develop theories about how helping people really hurts them. I understand that feeding wild animals is bad because they become dependent on it and forget how to hunt. They get lazy. I know that people have criticized the welfare system in America for this same reason. These ideas have validity, but they are not all-encompassing. Sometimes helping people is just nice. Sometimes it's just the right thing to do. Imagine the Good Samaritan passing by the wounded traveler and saying, "This guy should have known better than to take this route with a bag of money. He won't learn his lesson if I help him." That would sorta ruin the story, right? I think these theories stem from people getting overwhelmed by the needs in the world, so they write it all off by saying that helping people just makes them "weak". After all, "only the strong survive". Well thank you for rationalizing your laziness and indifference with a quasi-intellectual system of thought. Perhaps that system will help you out the next time you're in trouble. #5 Always have a better story. Have you eaten lunch with this person? Everything you say has to be superseded. If you went off a ten-foot jump, they went off a fifteen-foot jump. If you caught a 12-pound fish, theirs was most certainly 15 pounds! The topic doesn't matter. They're always ready to spew out another bodacious story that makes yours look like it belongs on the 14th page of the worst paper in town. "This is easy. Just change the topic until you find something they can't invent a story about." I've tried that. They just wiggle their way out of your topic and back to something they like talking about. You have two choices: leave or get a roll of duct tape.